The tree at the Grove House estate had seen everything—war times, peace times, the ebb and flow of people, machines, reliable change. Then again, you don’t stand around for more than 200 years without bearing witness to a bit of action. The estate is one of many tucked into the folds of New York’s Hudson Valley. It belonged to Philip J. Schuyler, the son of General Philip Schuyler. General Schuyler was a New York senator in the 1760s. He was a vocal critic of the colonial government and its tyrannies. Consequently, when the time came for the Continental Congress to choose up its military leaders, Philip happily said, “Yes please,” accepting his appointment as General where he did regular war-type things like rally troops and plan the Invasion of Canada (true story). General Schuyler owned a few estates around New York state, as one does, in places like Saratoga and Albany. The Grove House was built in 1795 in the small town of Rhinebeck NY. The property went to his son, Philip J., who lived there with his wife, Sarah. The couple enjoyed pleasant times at Grove House; Philip J. ran farms and other estates owned by his wife’s family in the area and sometimes they entertained people like Philip’s brother-in-law, some schmoe named Alexander Hamilton along with another local slouch named Aaron Burr. No big deal. The legend states (and let’s face it, myths beat truth every time) that Philip J. was out walking his expansive property one day and noticed a walnut on the ground. He dutifully nestled the nut back in the soil and went on his way. Cut to two centuries later, pan in on an enormous, startling black walnut tree topping out at over 126 feet tall carrying a circumference of around 22 feet. In 2012 the Schuyler tree, as it came to be known, earned a spot on New York State’s Big Tree Register (true thing), run by the Department of Environmental Conservation, where it was declared the state’s “champion” black walnut tree. It was literally a dark and stormy night in 2014 when a run of powerful storms ripped through the area, splitting and toppling the majestic creature. My friend Todd tells me the story of the Schuyler tree and I can’t help but gasp when he talks about its downfall. The devastation is palpable. He swallows hard. My hand unconsciously falls across my heart as if I were receiving the bad cancer news of a friend. Trees are as precious as our children; they breathe for us; they are engines that power life and maybe the most profound reminders of what it means to live in harmony. The trees are the patient watchers and their wisdom is precious. “But then they called me,” says Todd with a rueful smile. Todd is another gentle giant of sorts, a tall, hearty man with a line-backer’s build and impish blue eyes, he is an artisan woodworker who runs his own company called Living Edge Designs. Todd works exclusively in reclaimed and found wood—trees felled on purpose with no means to remove them or those like the Schuyler tree that met their sudden, violent ends through natural forces. 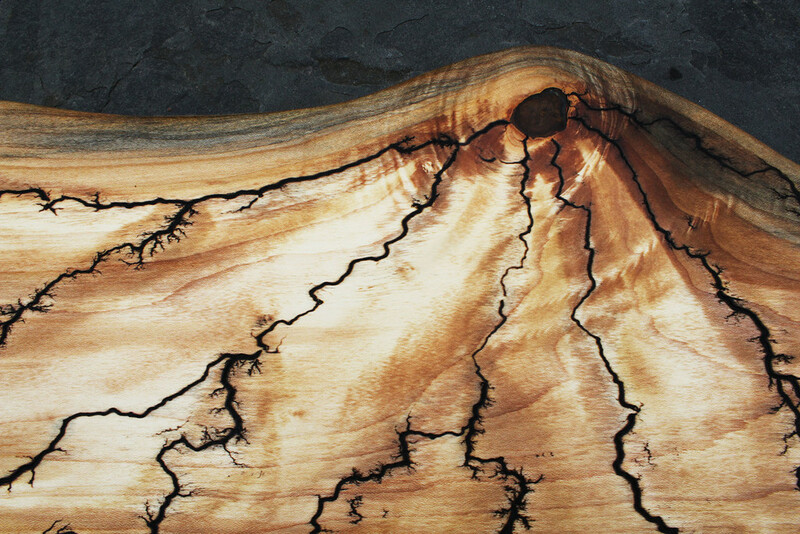 He transforms the wood into exquisite serving boards and art pieces, giving the trees a chance to live on; in this way, Todd dabbles a little bit in the God business (whichever one you’re into) reincarnating nature. We’re standing in his woodshop, which is not much more than an outsized storage shed on his home property. In addition to a wood stove and several lethal looking machines, there are thick slabs of wood measuring twelve, fourteen, and even twenty feet in height stacked neatly like matchsticks along the perimeter of the space. Bark skirts the sides of the boards, this is the “living edge” that Todd took as his company name. Many of the pieces retain the fluted bits of tree, it’s wild skin, smoothed and sanded to seamlessly mesh with the board itself. Todd makes a few quick marks with a pencil on a wide stretch of wood, sketching out the curve of what will be the handle of a large serving paddle. “Look at this great energy here,” he says, lightly tracing the lines in the grain that seem to swirl and pool down the board. “What are you, the wood whisperer?” I joke and he smiles and blushes a little. “I guess so.” Todd is shy, which is one of the many qualities that makes him disarming and warm. But he’s not shy when he’s talking about his work. Each piece has personality and its own life, he explains, and he considers that carefully when he sketches and again before he cuts. The grain of the wood tells its own story with the way it flows. Many boards contain rough, ugly knots, small angry-looking portals. Todd explains how those are actually sweet spots, resting areas that can be hollowed out slightly for a dipping bowl or votive holder or a place to make it a hangable piece while still keeping the natural designs in the wood. I notice them in many of the boards and start to see them less as imperfections to be buffed out, but as concentrations of energy, spirit even: pulse points. When the Schuyler tree toppled, those involved in its removal knew about Todd and his business. They offered up pieces of the tree to him, a bitter-sweet opportunity, but the chance to extend the legacy of such a beautiful, important guardian of the environment was a no-brainer for Todd. For the last year or so, the Schuyler tree has lived on in long, smooth flight stands, serving boards and paddles, and even lovely decorative centerpieces. A few days later I stop by the weekly farmer’s market where Todd and his wife, Donna, have their table. I have an eye out for holiday gifts knowing that these are more than pretty things to keep in your kitchen. These are still, to me, living, breathing parts of our earth. There is a short, squat piece on the table that contains two votive holders. It has a subtle curve to it resembling a bird’s wing. Unlike some of the other pieces with their eddies and ovals, the lines in this piece are all sleek, all forward momentum like the grooves on a record stretched out flat disappearing into some unseen point. I run my hand along it, the surface is softer than baby hair. “You like that one?” Todd asks. I nod. “That’s some of the Schuyler, it’s one of the last pieces. The stock is running out now.” We let that last part settle between us. The past tense sticks to the air. Plenty of the tree has gone on to “good homes,” which is no small thing. That there soon will be no more Schuyler tree to share is also no small thing. Todd doesn’t have to resort to hucksterism to seal a deal because his craftsmanship speaks for itself. I would want the piece even if he hadn’t casually dropped the limited-time-only detail. I was already committed to the legacy of the Schuyler tree before I saw his work. I knew I wanted to be a steward for it in some way if only to be able to be the keeper and teller of its extraordinary story. After all, the trees keep our histories, the least we can do is return the favor.